My knowledge of current Japanese pop music is not all it could be, but I became quite excited when I first heard RAYCHELL’s new album, which will be released on 24th April. RAYCHELL’s debut album, L>R, is a delightful mix of rock, pop and dance, with a couple of sway-inducing ballads thrown in for good measure. Gamers among you may recognise the opening track on L>R, ‘Coils of Light’, which is used as the theme for Dragon’s Dogma: Dark Arisen, an extension/re-release of the 2012 fantasy video game Dragon’s Dogma from Capcom, which is due for release on 25th April. Long gone are my days of playing computer games, but doesn’t this look exciting? In this song especially, RAYCHELL’s voice reminds me of Mika Nakashima, who I have loved since she starred in and recorded the soundtrack for the film Nana. RAYCHELL has the same kind of dark sexiness as Mika Nakashima too, which I’m sure will make her an instant hit! RAYCHELL’s career as a singer began in 2009 under the pseudonym LAY (changed to RAYCHELL in 2012). She released her debut single ‘Kono ai de aruyouni’ in 2010 and followed this up with the double single release ‘Smiling’/’Flower’. ‘Smiling’ was used as the end theme song for the anime series Tamagotchi. Kawaii! RAYCHELL’s album is quite a diverse collection, and I found myself bopping along to the upbeat numbers and thoughtfully dreaming to the slow ones. Generally, I prefer the faster numbers, with ‘FACE FREE’ and ‘EARTH BEAT’ being my favourite tunes on the album. Check it out if you can! 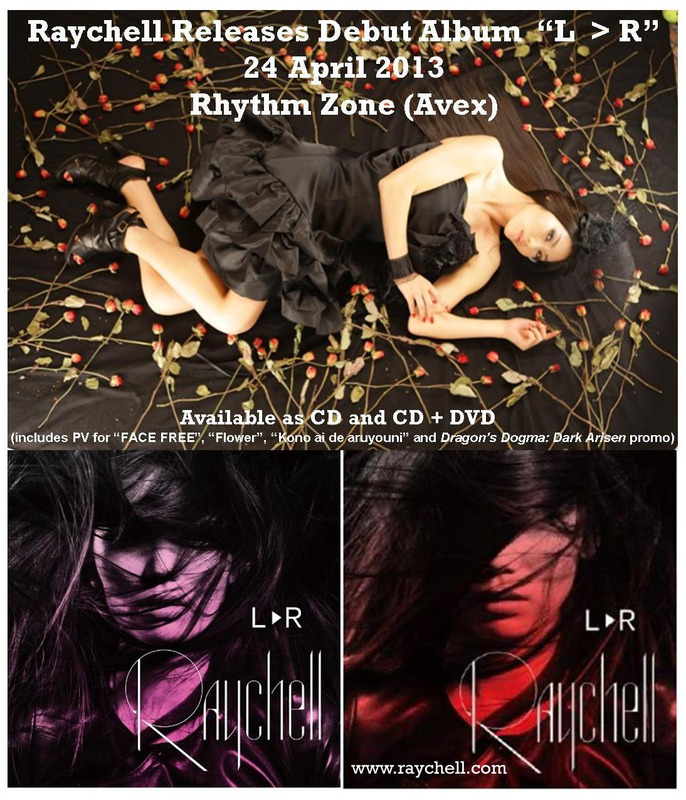 RAYCHELL’s debut album, L>R, will be released by Avex Rhythm Zone on 24th April. L>R is available as CD and CD + DVD (includes PV for “FACE FREE”, “Flower”, “Kono ai de aruyouni” and Dragon’s Dogma: Dark Arisen promo). The CD is not actually being released in the UK, but if you want to purchase it from the UK I’d recommend using Play-Asia.com or CDJapan.co.jp. Japanese CDs can also be ordered from JP Books. It is also available for download from iTunes Japan.